Indiana Target Area: Elkhart, Fulton, Kosciusko, Lagrange, Marshall and Noble Counties. WINTER WEATHER ADVISORY REMAINS IN EFFECT UNTIL 10 PM EST THIS EVENING. *WHAT: Freezing rain expected. Total ice accumulations around one tenth of an inch expected. *WHERE: Portions of northern Indiana and southwest Michigan. *WHEN: Until 10 PM EST this evening. *ADDITIONAL DETAILS: Freezing rain possibly mixed with sleet, will change to rain later this evening as air temperatures climb above freezing. Plan on slippery road conditions for the afternoon and evening commute. Instructions: A Winter Weather Advisory means that periods of snow, sleet or freezing rain will cause travel difficulties. Expect slippery roads and limited visibility and use caution while driving. Indiana Target Area: Blackford, Cass, Grant, Huntington, Miami, Wabash, Wells and White Counties. Areas of Freezing Rain and Freezing Drizzle. *ADDITIONAL DETAILS: Light freezing rain and drizzle tracking through the area can result in hazardous travel conditions. There can be a small glaze of ice as this feature moves through. Motorists should be alert for ice on roadways. Reduce speed, increase following distance and allow plenty of stopping distance. Indiana Target Area: Elkhart, Fulton, Kosciusko, La Porte, Lagrange, Marshall, Noble, Pulaski, St. Joseph and Starke Counties. WINTER WEATHER ADVISORY IN EFFECT FROM 1 PM EST /NOON CST/ THIS AFTERNOON TO 10 PM EST /9 PM CST/ THIS EVENING. *WHAT: Mixed precipitation expected. Total ice accumulations of up to one tenth of an inch expected. *WHEN: From 1 PM EST /noon CST/ this afternoon to 10 PM EST /9 PM CST/ this evening. *ADDITIONAL DETAILS: Precipitation is expected to overspread the advisory area this afternoon, possibly starting a a brief period of snow, before changing to freezing rain, possibly mixed with sleet. While air temperatures will eventually climb to near or above freezing, surface temperatures will likely remain cooler, leading to a longer duration of freezing rain into the evening. Plan on slippery road conditions for the Tuesday afternoon commute. Instructions: A Winter Weather Advisory means that periods of snow, sleet or freezing rain will cause travel difficulties. Expect slippery roads and limited visibility, and use caution while driving. Indiana Target Area: La Porte, Pulaski, St. Joseph and Starke Counties. WINTER WEATHER ADVISORY REMAINS IN EFFECT UNTIL 10 PM EST /9 PM CST/ THIS EVENING. *WHAT: Freezing rain expected. Total ice accumulations of one to two tenths of an inch expected. *WHEN: Until 10 PM EST /9 PM CST/ this evening. Indiana Target Area: Adams, Allen, Blackford, Cass, De Kalb, Elkhart, Fulton, Grant, Huntington, Jay, Kosciusko, Lagrange, Marshall, Miami, Noble, St. Joseph, Steuben, Wabash, Wells and Whitley Counties. WIND CHILL ADVISORY IN EFFECT FROM 6 PM THIS EVENING TO NOON EST MONDAY. *WHAT: Very cold wind chills expected. Wind chills as low as 15 below to 25 below zero expected this evening through Monday morning. Bitterly cold conditions can also be expected today. Wind chills of 5 below to 15 below zero this morning will only moderate to zero to 10 below zero this afternoon. *WHERE: Portions of northern Indiana, southwest Michigan and northwest Ohio. *WHEN: From 6 PM this evening to noon EST Monday. *ADDITIONAL DETAILS: The cold wind chills could cause frostbite on exposed skin in as little as 30 minutes. Instructions: A Wind Chill Advisory means that cold air and the wind will combine to create low wind chills. 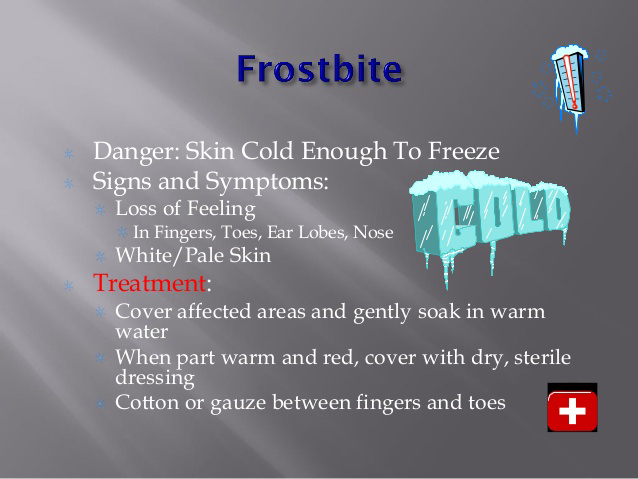 Frostbite and hypothermia can occur if precautions are not taken. Make sure you wear a hat and gloves.